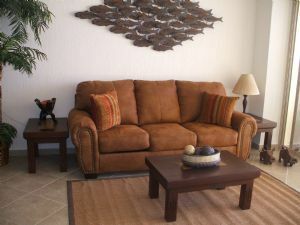 This condo has 1 bedroom and 1 bathroom and is located inside the beautiful Sonoran Sky Resort. The Sonoran Sky resort is one of the newest luxury resorts on Sandy Beach in Rocky Point. The Sonoran Sky has a full service spa, aqua bar, state of the art fitness center, water slide, beach front swimming pools, Jacuzzi and a convenience store. Here you have a small but cozy condo on the 6th floor of the resort. This condo can sleep 4 people. Two people will be happy in the bedroom and two people would be comfortable on the sleeper sofa in the living room. As you can see a lot of attention and detail went into the décor of this condo. The living room has a brownish orange suede sofa with a coffee table, end tables and a beautiful brass piece of art in the shape of a diamond above the sofa. The room has a tropical feel with silk plants placed throughout the condo. The other side of the living room has a small entertainment hutch and a wall mounted flat screen TV hangs on the wall above. The entertainment cabinet below holds a DVD, VCR, and stereo. The condo has wireless internet and cable television. The kitchen has beautiful stainless steel appliances, tan granite counter tops and dark wood cabinetry. The kitchen comes fully stocked with pans, pots, bar ware, dishes, glasses and so much more. You can really put together a beautiful meal in this state of the art kitchen. The kitchen has a bar with four bar stools where you can enjoy a meal or a cocktail. The master bedroom has a king size bed with a high head board in dark wood. One side of the room has a green silk plant and the other side has a lighted bed side table. The bedding is done in light blue and tan diamond print. The walls are adorned with complimenting pieces of art and there is a dresser with a TV on the opposite wall. The bathroom has a single sink vanity with a walk in tub/ shower combo. The terrace is the perfect spot to enjoy a frozen margarita or a cold cerveza. You can watch the sunrise or sunset over the Sea of Cortez. The terrace is furnished with a table that has four chairs for dining by the sea. The condo has a washing machine, dryer and ceiling fans throughout. This is a very comfortable condo!